After seeing such a positive response to the weekend wardrobe inspiration posts that I’ve done recently (here and here, if you missed them! ), I’ve decided to see if I can make these a bit more of a regular thing around here! 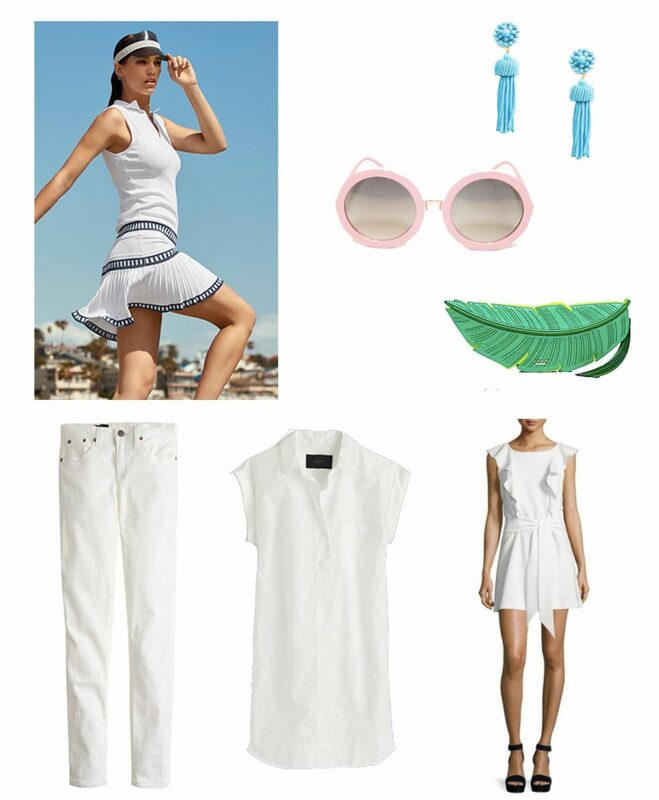 This week’s post is all about summer whites inspired by Wimbledon. When we were in London last summer at this time, there were lots of festivities and cool things going on in the city related to Wimbledon like special cocktails, decor at restaurants and bars and, of course, lots of media coverage and promotion. We weren’t there to go to the tournament but, right then and there, Clint and I officially added it to our (sans children) travel bucket list! Whether you’re watching or attending, or just don’t care about it at all, take little fashion inspiration and get out your favorite summer whites this weekend! One of the best ways to wear white in the summer is the LWD (little white dress). A little white dress can take you from day to night or even from brunch to a playdate! I thought about buying this one earlier in the spring, but now that it’s on super sale, I’m ready to pick it up. If you’re looking to splurge, this one is my top pick. And, if you love a good jumpsuit (as I do) instead of a dress, this one is ALL yours! White jeans are also a perfect way to start building an all-white summer weekend look! I prefer skinny white jeans paired with a blousy top, but these flares are also high on my white jeans wish list and a distressed pair is perfect for weekend errands and a little patio cocktail. A little color goes a long way with an all white look and pairing your look with some fancy sandals, a bright pair of sunglasses or a pair of turquoise earrings (that you’ll wear with just about everything all year long). I hope you all have a great weekend! Thanks so much for stopping by today!